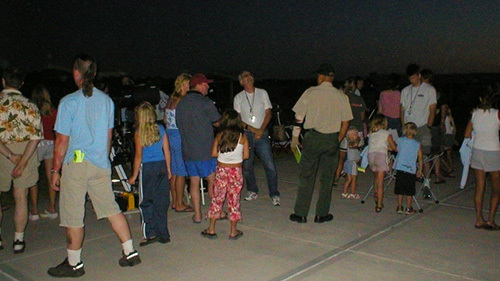 To offer more opportunities for public observing, our club now does star parties at Millerton Lake, scheduled on Saturday evenings in June, July, and August of each year. We set up on the Madera County side of the lake, at the Millerton Lake State Recreation Area parking lot. This location allows us to provide astronomical observing to visitors from the area as well as those who are camping. Plan on us being out there from sunset until approximately 10:00pm, though some of our members may stay later to do additional observing. Depending on how many people are visiting or camping, the observing site may get a bit crowded. Please be patient and courteous to the guests around you.